Sean is knowledgeable. Most friendly mechanic. Friendly services and staff. Always honest and helpful. Really go out of their way to get the job done on time and will try to fit you in whenever they possibly can, even last minute. 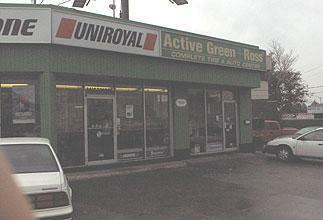 I live in Ottawa and come to this store in Toronto just because of the outstanding excellent service. I have never had this kind of service. Many thanks to everyone who came through for me yesterday during the snow storm. keep up the excellence. I am very please with the service i have receive in this store, thats why i keep coing back. the people that works there are very frienly, Thank you. Nice customer service and all workers are friendly. The team at Active Green + Ross weâre fantastic. They were quick and very knowledgeable. I would just like to compliment Van, Brandon and all the mechanics for their excellent customer service. I had 2 visits in the space of a week and would not hesitate to recommend 2151 Jane to anyone. Great Job Guys! Brandon, Van and their team are awesome! I do appreciate there help and advice. They are not pushy, but very informative. Even though I've only known them for a year, I feel as if I've known them for much longer. Thanks for the great service!